As a result of the American influence on various clothing fora, I have noticed a tendency for even British posters to use Americanism like "tux" . So for those of you wanting to stick to the Queen's English, here is a guide. The British English is on the left. English 'knickers' are for ladies' smalls and the gents' version is either 'boxers' or 'Y fronts'. Besides 'Plus twos' and 'Plus fours' there are 'knee breeches' or 'breeks'. I don't think that 'Ascot' is much used in English for cravat - either the formal or the informal version is normally just 'cravat'. 'Slipover' I haven't heard at all and 'jumper' is, besides other terms, also used. Some useful additions, though, Sator - such as American 'garters' for 'sock suspenders'. I'll also look at my list deriving from the one that we did earlier. Yes, I've read of that theory about the P-jacket. However, Devere (London 1866) also gives the term "pea jacket" as a synonym of "reefer jacket". The term "paletot jacket" is unique to Devere, who divides coats into two types: body coats and paletots. He calls coats like Chesterfields, paletots and jackets without a body coat construction a "paletot jacket". You can tell by the way he says that "paletot jackets" are popular for "lounging" that he is refering to lounge type coats. This is the earliest extensive reference to lounges and reefers that I own. Properly speaking, a lounge coat is therefore always single breasted. It is only in American English that the single and double breasted jacket are considered to be variations of the same garment. Traditionally, the Americans talk about both single and double breasted "sack coats". I suspect that the modern tendency to talk about single and double breasted "lounge coats" is an American influence. So when we talk about cricket blazers in team colours, or to the single breasted jackets worn by schoolchildren as part of their school uniforms as "blazers", this is the correct British English usage of the term. The crew members of the H.M.S. Blazer wore a single breasted tunic with blue and white stripes - and it was this garment that Queen Victoria was impressed by. 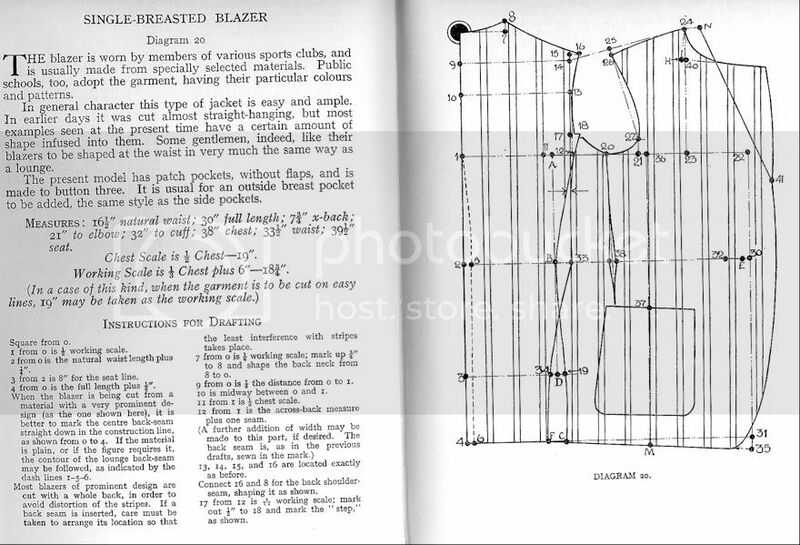 The use of the term "blazer" to denote a "reefer coat" is, I suspect, another Americanism. 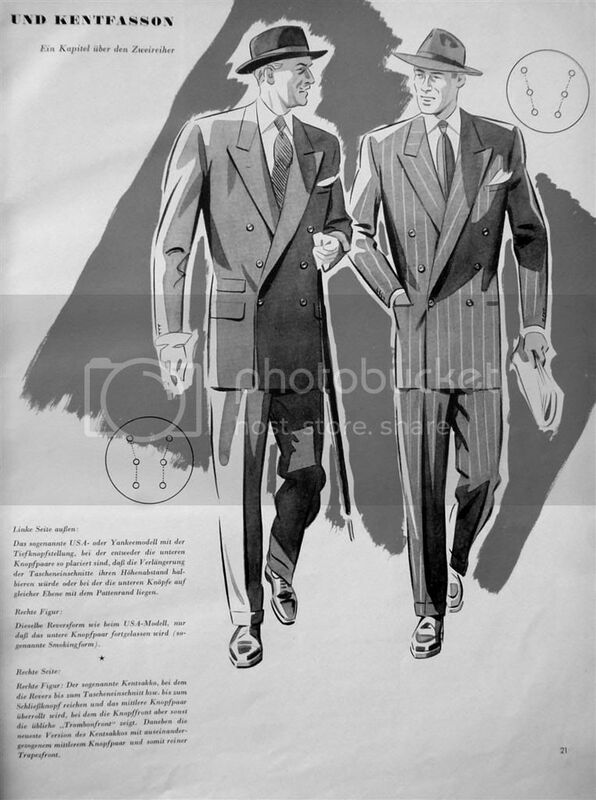 As for "Ascot" to denote the formal daywear dress cravat, older British texts from the 1940-50s definitely use this term. Some Brits have showed up and pointed out to the Americans around that properly speaking Ascot refers only to the formal form of neckwear. I agree that the term Ascot is not really in fashion at the moment, and they are generally referred to as "cravats". The origin is right but these were more usually called pea coats. Whether the pea jacket is the same as, or a derivative of, the pea coat I'm not sure. At the time of the Napoleonic wars and possibly earlier a captain would have pea coats made for his long boat crew to ensure they made a good impression when meeting local dignitaries because, as NJS says, there were no uniforms for the other ranks then. And you can find plenty more if you look on UK Google. Thanks for your contribution. I guess this raises as many questions as it solves - namely, what was the coat in question most commonly called during the period of the Napoleonic wars? 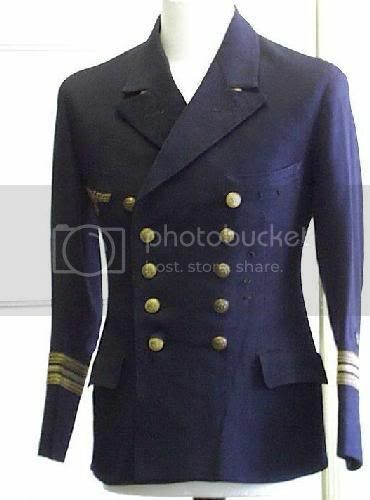 Reefer Jackets were adopted from the British by the US Navy some 75 plus years ago and were at first called pilot coats, as in the pilot of a naval vessel, of course. In time, the name pilot coat was shortened down to P-Coat and then humorously lengthened again to Pea Coat. They were Traditionally made from 32 ounce wool, and trimmed with large, yet fashionable buttons. Yet, the quoted text from Devere, 1866 discussing the "pea jacket" casts some doubt as to whether the term "pea coat" was so modern and merely humourous in intent. Though usually worn as an overcoat over another coat it be worn short as a body coat. 'Pea-jackets of pilot cloth or mohair, made D-B with wide lapels and velvet collar, the skirts close behind and banyan hips, this has been the raging fashion.' 1836. Gentleman's Magazine of Fashion. Nowhere in their book is there a reference to the term "pea coat" - only pilot coat aka pea jacket. 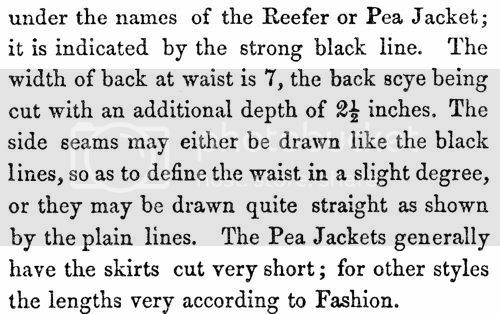 The index for "pea jacket" also refers the reader to "also see Reefer Jacket". Heavy, warm, woolen jacket, usually loose, short, and double breasted. Worn by sailors, fishermen, etc. I would have to go away and do more research on this but the reference comes mainly from military rather than clothing sources. The other thing which made me wonder is that they are sometimes cited as having wooden toggles rather than buttons. This is beginning to veer quite some way from the original topic of this thread but I wonder if there is any relationship between these pea coats and the duffle coat. It's possible the duffle coat evolved from the pea coat. 'Pea' coat came from slang for cold, foggy conditions; 'pea soup' and not from any bodily function. This only relates to evening dress. The idea of semi-formal daywear seems to be an American/European concept. Even when a lounge coat is smartened up with striped trousers, it was always considered informal daytime business dress. Americans call any odd lounge jacket cut without any notable sporting features, a "sports coat". According to The Fairchild Encyclopedia of Menswear 'pea' in peacoat is an English corruption of the Dutch word 'pij'*. A 'pij' is a piece of clothing made from a rough wool cloth. Unfortunately, the origin of the word 'pij' is unknown. Btw: a pea in Dutch is an 'erwt'. *) The Dutch word for peacoat is 'pij-jekker'; 'jekker' is the same as English 'jacket'. Nobody uses the word pij-jekker, though. We also call it peacoat. A strange term is "Coventry coat" used by the German clothes retailer John Crocker, which claims to sell classical English fashion. I couldn't find any information of such a name nor did someone I know in Coventry ever hear of it. Wonderful thread. I was looking at this thread and wondering why not just call it peak lapels and I received my answer here. I've just added one more thing. A frock coat in American English is a generic term for a body coat. For example, a morning coat is called a cutaway frock. 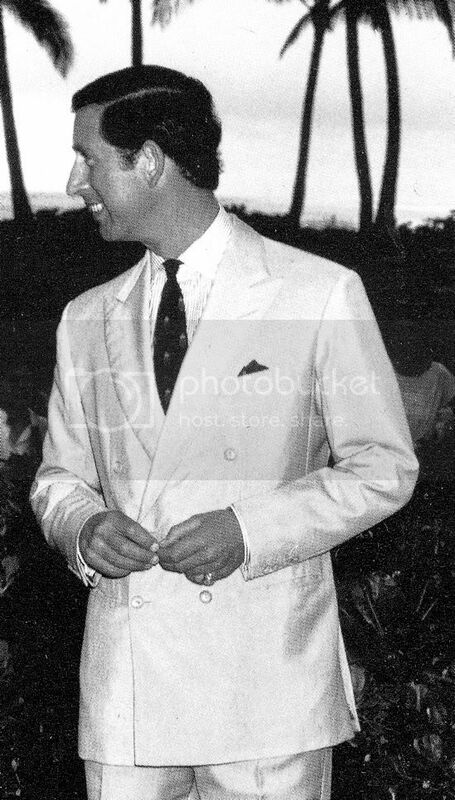 This means that what in British English is called a "frock coat" is called a Prince Albert coat/frock in American English. In the Edwardian era the British used to make fun of the Americans for being unable to tell the difference between a morning coat and a frock coat, as both were referred to as a "frock coat". By the 1920-30s American cutters start to call a morning coat a "cutaway frock" to distinguish between them. Fascinating. I wonder how dated this American English usage is, however. 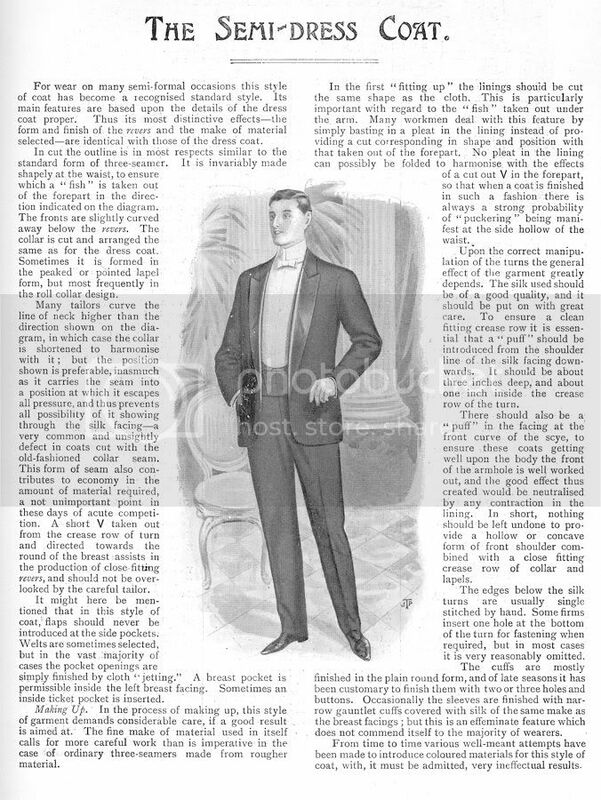 Granted that the phrase "frock coat" is rarely used in the United States these days except as a historical term, the only place I've ever encountered the term "Prince Albert" for a coat is in a British English dictionary (as the translation into US English of "frock coat.") I don't believe I've ever encountered the term "cutaway frock," as opposed to "cutaway," which is generally used for morning coat. I am talking about current and recent general usage here. Perhaps these US terms are obsolete or only now jargon used technically in the trade? Perhaps these US terms are obsolete or only now jargon used technically in the trade? Sports jacket, which means anything that is not a suit jacket or a tuxedo. During the coverage of the marriage of William and Kate, every American TV correspondent on the scene had to do his or her little bit about "morning coats."